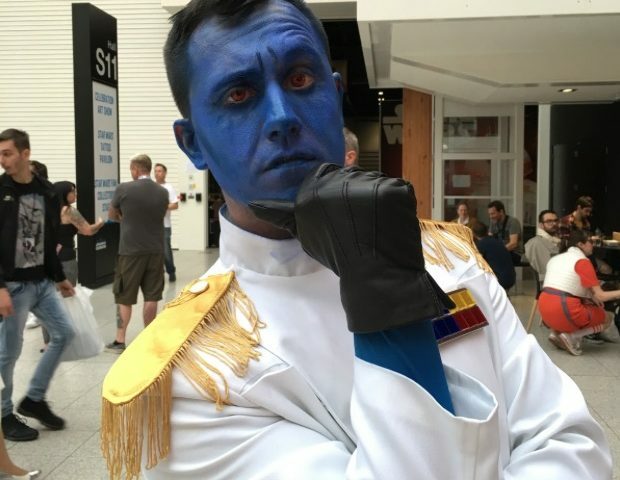 blue face paint in the photo above remains a mystery, but he had one helluva day at Celebration Saturday. When the day began, he was a character excised from the canon, leading a person walking by him to ask, “How does it feel to know you don’t exist?” After the Rebels panel, he found himself posing for photo after photo, even one with Andi Gutierrez and Peter Townley, hosts of The Star Wars Show (check out Guitierrez’ Twitter for the photo). By the end of the day, when asked if it was ok to take a photo, he apologized for his fading makeup. “It’s been quite a day!” he said. And quite a day it was for fans of the Grand Admiral. For them, Day Two of Celebration was a holiday, a birthday and winning the lottery all rolled into one. It will be a day long remembered as Thrawn’s triumphant return to the Star Wars universe, one greeted with the most sustained, thunderous applause of the weekend thus far. News of Thrawn’s return came during the Rebels Season 3 panel. After Friday’s “Ahsoka’s Untold Tales” panel, fans weren’t expecting any significant news about the fate of Anakin’s former Padawan. After the surprise at last year panel, though, when merely Rex’s voice during a trailer brought the house down, the audience was ready to be amazed. The panel, the most sought after bracelet of the day, prefaced a special preview of the first episodes of Season Three. Moderator Warwick Davis, Supervising Director Dave Filoni and voice actors Tiya Sircar (Sabine) and Sam Witwer (Palpatine/Maul) fell into an easy, humorous patter, never once giving a hint of what was to come. If you watched the live stream of the panel, you’ve heard some random cheering when the initial shot of Thrawn, shown from behind and in the shadows, is revealed. What’s missing is the buzz – a mix of disbelief and hope – that rippled through the audience. To one side, a fan started praying that it was true, while on the other, a young man spoke excitedly in Spanish to his girlfriend, the only word that I understood was “Thrawn.” Nearby, a woman said she had goose bumps and kept repeating “Please, please, please.” Building to a crescendo like a boiling tea kettle, the crowd exploded when the Grand Admiral finally stepped out of the darkness in all his blue-skinned/red-eyed glory. Those in attendance most likely had to watch the trailer online afterward to hear Thrawn speak (like that’s a chore!) because the soundtrack was eclipsed by the joyous screaming. If one were to intercut clips of the Rebels panel audience with fans reacting to their teams winning the previous week’s Euro Cup games, no one would probably be able to tell the difference (other than one group would be full of amazing cosplayers!). Lost in all this excitement – poor Wedge Antilles who will make his first appearance in the animated series. Anthony Daniels, donned in his gold lame jacket accessorized with an arm-length red bandage, read the recent comic book C-3PO as if it were a children’s bedtime story, complete with music and images. Daniels, brought emotional depth to the already moving tale and one can only hope that the segment winds up on StarWars.com, especially since so few in the audience seemed to know the story. By the way, the BBC should give Daniels and Davis their own TV show – their lively banter was a treat to see thanks to comic timing is quite impeccable. Daniels has the fussbugdet down pat and Davis deftly works the role of the put upon sidekick. Watching the two break down into a childlike giggle fit after a fan asked if Daniels had his own on-set buffer was worth the price of admission. Near the close of the day, those on the dealer’s hall received an unexpected treat when Mark Hamill spontaneously took to The Star Wars Show stage and spoke to fans. The whole affair had a stream of consciousness vibe – Hamill talked about his dog, his cut scenes from A New Hope, his appearance on Stephen Colbert’s show – but none of that mattered as fans ran back through the hall at sound of his voice. Not even the repeated announcement “Celebration is now closed” could stop him. But what started off as a request by a sweet-voiced Mary Poppins turned into reprimand from an upset school mark by the third time, and Hamill reluctantly left the stage. Read Walt’s previous Celebration Europe recaps here and here.